It was the wildcards, Manoa Drollet and Bruno Santos, that stole the show today at the Billabong Pro Tahiti. Ultimately it was Bruno Santos who won the event after defeating Teahupoo local Monoa Drollet in a very undramatic final. Big congratulations goes out to the Brazilian, Bruno Santos, as he was an absolute giant slayer defeating Mick Fanning, Taj Burrow, CJ Hobgood, and others on his way to winning one of the biggest events on the ASP World Tour. It was a long-slow day at Teahupoo as one of the most notorious waves in the world failed to deliver any kind of a consistent swell. The heats throughout the day were very slow as the 2-3 ft swell was on the decrease which made for long waits between sets. Unfortunately, that left many of the surfers unable to find any kind of decent waves in their heats, often times seeing competitors catch one or less decent wave in a 30 minute period. It’s unfortunate that a contest of this caliber at a break this heavy has to be decided in small waves like this. It would’ve been interesting to see what would have happened had mother nature cooperated. We can’t take anything away from Bruno Santos though as he rightfully deserves the victory he earned today. Here’s to hoping Fiji’s pumping! Fanning won’t be the only big name making a sooner than expected exit from Teahupoo. Jamie O’Brien had the unexpected misfortune of meeting Kelly Slater in rd. 2 following Slater’s round 1 loss to ‘Chopes-specialist Manoa Drollet. Kelly came out firing in their heat and O’Brien quickly found himself in an a combination hole that would lead him to sharing the same fate as Fanning following an 18.70 to 13.90 loss. Kelly has now moved into rd. 3 where he will face the man responsible for putting him up against O’Brien in the first place, Manoa Drollet. “It’s excellent to beat Kelly,” Drollet said. “I feel bad, he was a bit pissed, but it’s a contest. I was lucky to get the best two waves of the heat, Kelly got one in the end and he almost came back. In this competition, the guy who gets the good waves is going to win the heat, and that was me today.” Drollet kept Slater out of position for most of their rd. 1 heat, forcing Kelly to take off deeper than he wanted do which resulted in the 8x world-champ getting pitched a time or two. Their rd. 3 match-up will surely see both surfers coming out ready for battle. When you’re a wave like Teahupoo, you don’t really need any hype thrown your way. With that being said, I’m throwing hype anyway. We’re just about two weeks out from the 2008 Billabong Pro Tahiti. And if the swell trends continue this could possibly be one of the all-time events at the bone-crushing left. Teahupoo has made quite a name for itself in not much more than a decades time. The break that was once thought to be unsurfable, will be on display for it’s 10th WCT event From May 8-18 and as we covered previously, it has taken it upon itself to remind all surfers that it’s right around the corner with its thrashing of last years champ Damien Hobgood. Yep, we’re only two weeks away from the 2008 Billabong Pro Tahiti…. 1. Kelly Slater (USA)- 2400 pts. 2. Bede Durbidge (AUS)- 1908 pts. 3. Mick Fanning (AUS)- 1764 pts. 4. Taj Burrow (AUS)- 1476 pts. 4. Jeremy Flores (FRA)- 1476 pts. 6. Andy Irons (HAW)- 1464 pts. 6. Joel Parkinson (AUS)- 1464 pts. 8. Bobby Martinez (USA)- 1286 pts. 9. Kai Otton (AUS)- 1200 pts. 9. Adriano de Souza (BRA)- 1200 pts. 11. Adrian Buchan (AUS)- 1142 pts. 11. Dane Reynolds (USA)- 1142 pts. Not a whole lot of surprises so far. The “Usual Suspects” are all in solid positions It’s good to see Dane up near the top after a couple of events. I thought his surfing exceeded everyone else’s at Bells and was just hit with bad luck against Taj in the quarters. Goofy’s like Bobby Martinez and “Ace” Buchan have to be pumped on flipping things around on Teahupoo’s left, especially the defending champ Martinez. Speaking of Teahupoo, Kelly Slater is going to have a tough time fooling anyone into thinking that there is even the slightest chance he won’t be there. I still think he will end up skipping a couple of events this year, this just won’t be one of them. Kelly Slater has done it…. again! By taking a big risk in the final and making the paddle a few hundred yards down the beach to Rincon he showed us once again why he is “The King.” Boosting a huge air with just minutes left in the heat, Kelly got the score he was chasing the entire heat. Bede Durbidge surfed as well as you could expect leading pretty much the entire heat, but Slater just wouldn’t be denied. 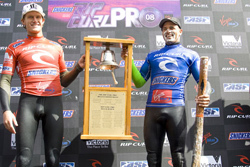 Congratulations Kelly Slater on winning the Rip Curl Pro Bells Beach! We look forward to watching you in Tahiti. With the ASP Tour making the transition from Snapper Rocks to Bell’s Beach we have seen a big part of what makes the tour so great year after year. Each stop provides unique conditions that pose new challenges. Mick Fanning – By having to surf in the second round, the reigning world-champion found himself in a very unusual position. 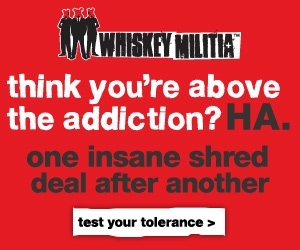 By posting a meager 7.24 score in Rd. 1, Fanning found himself in a spot he hasn’t been in for 15 events- Rd. 2. I was curious to see how he would perform as he spent the weekend leading up to Bell’s strapping on the proverbial ball and chain. He righted the ship in Rd. 2 however, and now faces a tough third round match-up with Bell’s local Troy Brooks. Kelly Slater – This really goes without saying, but I’ll say it anyway – Kelly put on a clinic. The amount of speed he generated from his bottom turn on his 9.5 is almost unfathomable. “I didn’t do a whole lot on that wave,” Slater said. “I did one turn to start off with and then this section loomed up ahead of me that was crazy – it was so smooth, especially for what’s out there. I had a ton of speed and I held the bottom turn as long as I could and was able to get that carve in. It reminded me of the turn I had in the final against Parko (Joel Parkinson) that one year.” The 35 yr old 8-timer is aging like wine and showing no signs of slowing down anytime soon. Dane Reynolds – Dane’s putting up a 9.73 in Rd. 2 was amazing. His humility and attitude when talking about the score even more so. “I got pretty lucky,” Reynolds said of his heat against Alves. “I went out there with a good, positive attitude feeling like the waves were going to come my way and they did. I didn’t see another wave out there that looked like the ones I got, so I was pretty fortunate.” With Jordy going out, this leaves Reynolds as the feature rookie at Bell’s and it will be intriguing to see if he can keep this level of performance going. Bruce Irons – It’s hard to say what’s going on with Bruce. The bottom line is he is way too talented of a surfer to consistently be going out in the early rounds. He seemed particularly disinterested in his third round loss to Adrian Buchan at Snapper. How sick would it be to see him go the path of Jamie O’brien and just completely dedicate himself to the freestyle thing? Those two alone are surfing as progressively as any, and would serve as worthy pioneers for a new freestyle movement for surfing. As the 2008 ASP Tour moves from Snapper Rocks to Bells Beach there is an all too familiar name atop the standings. With the much of the build-up to the Quiksilver Pro heavily centered around so many others, Kelly Slater decided to remind us that as long as he decides to show up he is the favorite for any event. Again, that is as long as he decides to show up. There is still no confirmation of Kelly’s decision and we may just have to wait until the opening horn of his 1st round heat to find out if he will be among those looking to ring the famed bell when the 2008 Rip Curl Pro Bells Beach comes to an end. In a normal year on tour, average results through these first two Australia stops would still leave the top surfers with plenty of opportunities to make up ground throughout the rest of the year. 2008, however, is by no means an average year. With the number of surfers with legitimate title hopes as high as ever, there is an element of added pressure to finish well at Bells and hopefully come out on top. This is currently the position that defending Bells champ and last years overall #2 Taj Burrow finds himself in. He was surfing as well as ever at Snapper until his perplexing round 4 ousting at the hands of goofy-footer Adrian Buchan. Taj made it very clear at the beginning of the year that it is world-title or bust for him. With that being the case, he is going to need to come out firing at Bells and hope for a repeat performance of last years victory. So what can we expect to see at Bells this year? 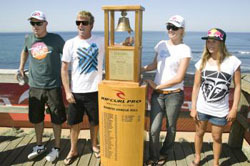 6 out of the last 7 Bells winners have come from the Slater, Burrow, Andy Irons, Joel Parkinson, and Mick Fanning group. This is a trend that is likely to continue as these are the surfers with the best shot at winning it all in this ultra-competitive year. Mick just got married over the weekend so it will be interesting to see how well he is able to stay focused following his tying of the knot. Parko and A.I. held their own at Snapper with 5th place finishes, but they will both be looking to improve on those results at Bells. Outside of the ‘usual suspects’ there is no one on tour who has experienced the taste of victory at Bells. That doesn’t mean we won’t have a 1st time winner, but given what is at stake I don’t see it happening. Bede Durbidge and Jeremy Flores seem to be the two with the best chance of ringing the bell for their first time. From the last half of 2007 until now, there are few who have surfed as impressively as Durbidge has. Flores went down to Slater in the semi’s at Snapper, and reportedly went straight to Bells to prepare for the contest. I would be surprised, but not shocked if either of those two found their way into a Bells Final. The forecast for Bells has event organizers licking their lips. However, we heard the same thing over at Snapper, but not a whole lot ever materialized in the form of swell. It was good, but by no means great. Hopefully higher quality surf will make its way to Bells Beach as we move throughout the week. As incredible of a competition as Snapper was, the added pressure of producing a solid result at Bells is only going to raise the bar that much higher. If the ‘08 Quiksilver Pro Gold Coast was any indication of how the rest of this years ASP tour will go, there is much to look forward to. The conditions all week at Snapper Rocks and D-bah were average at best. The competition itself however, was exceptional. THE KING – When it was all said and done, it was a familiar face on the podium. With so much focus on many of the other surfers, he decided to give us all a reminder of what it is that makes him so great. The man has ice-water in his veins. In almost every heat he surfed at the Quik Pro he seemed to pull out huge scores right when he needed them most. He seems to be leaning toward not going to Bell’s, or so he says, but here’s to hoping he shows up. It is a completely different tour without Kelly, and we’ll all be better off if his lead-off victory at Snapper will fuel his fire to continue on in search for his 9th world championship. THE OTHERS – Although I’m sure its of no consolation to Mick Fanning, Slaters uncommitted stance on surfing a full schedule in ‘08 combined with his runner-up finish at Snapper leave him in a solid position as he starts off his campaign to defend his title. In fact, if the ASP judges continue to reward Mick’s mechanical surfing as much as they did in the Quik Pro, Slater may be the only surfer capable of taking his crown. There is no denying the judges are quite taken with Fanning’s style. Last years rookie of the year Jeremy Flores picked up right where he left off and has made it known that he deserves to be considered among the title for this year and years to come. He surfs like a young Kelly Slater and will start seeing more and more of the winners circle as he polishes his game. We all know he wants that world title more than anything and it’s only a matter of when he wins it, not if. Both Parko and Taj came into this year with added pressure and while they killed it early on, both were looking for better results from their Snapper runs. The way they respond at Bells will tell us just how serious they are at making a legitimate title-run. THE JUDGING – Slater won yesterday, but had Mick pulled off the 8.61 he needed to come out on top at Snapper there would have been a lot more made of the questionable judging. While I’m not sure it’s intentional, there seems to be some real issues with how each judge is scoring a wave. Slater opened his bag of tricks and was surfing creatively while Manning stayed with his conventional massive bottom turns and snaps. Mick’s conventional style scored very well and go towards demonstrating the issue that surfing is facing. Even the judges themselves seem to be at a crossroad when it comes to how they score each maneuver. It will be impossible for the style of surfing on tour to progress if the progression isn’t rewarded. Surfing is headed for a revolution of progression and innovation, and hopefully the ASP judges will begin to see that. Leading up to the 2008 Quiksilver Pro Gold Coast all of the talk and hype was centered around the ‘Coolie-kids’ as well as Jordy and Dane’s first full year on tour. That was just fine with Kelly as it took much of the focus and pressure off of him. Eight-time world champion Kelly Slater started of this years ASP world tour on top with an unbelievably impressive performance at Snapper Rocks. Making this victory all the more impressive is the fact that Slater had to face 3-time world champ Andy Irons and then follow that match-up with a semifinal battle with last years rookie of the year Jeremy Flores just to make it to the final. In the final, Slater overcame hometown favorite (as well as some hometown judging, but more on that later) Mick Fanning 17.94 to 15.23 to claim his second Quiksilver Pro Gold Coast title and position himself atop the ratings for the first time since claiming his last ASP World Crown in 2006. Where does that leave the future of Slater as far as the tour goes? That seemed to be the question on everyones minds following his triumph. The way it’s looking, with it apparent that not even Slates knows if he’s going to be at the next stop at Bells, that question won’t be answered until the last few days leading up to the event. So will he continue on to number 9? Who knows. 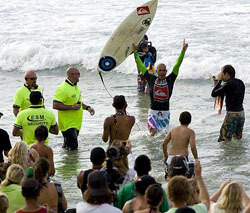 But for now, Congratulations Kelly Slater, the 2008 Quiksilver Pro Gold Coast Champion!